I’ve just spent a fascinating couple of days at Riesling Down Under. A celebration of Riesling with producers from around the world attending. Whilst devouring loads of seriously good juice, we had the opportunity to explore the different styles of Riesling, from clean, pure, dry styles, to those with a bit more attitude, driven by skin contact, barrel fermentation & maturation, pretty much anything you could do to a white wine. While the debate often headed down the line of what a typical Riesling should be in a particular Riesling growing region of the world, and, how to ensure site is expressed, I found myself returning to the old favourites to assess the wines: depth and length of flavour and aroma, balance, complexity, texture, and, freshness with good pre-bottling development. Most importantly harmony and a style that showed personality. One of the talking points paid most attention was the differences between dry styles, containing no sugar 2 grams per litre or less, and, sweeter styles that contained significant levels of grape sugar, up to 60g grams per litre and beyond. To put that into context, coke has 106g/L. Dessert styles such as the Beerenauslese and Trockenbeerauslese were a separate discussion. There were estates working more dominantly at one end of the spectrum, and, those with a range of wines across the spectrum. It was clear that all were experimenting, in both the winery and less so in the vineyard, some much more than others. The end call was always the same, make the best possible wine they could, from the grapes they had. This was true across, Australia, South Africa, New Zealand, France, Germany and Austria. The most extreme example of experimentation being run by Johannes Hasselbach from Gunderloch, in this case for dry Riesling. Wurzelwerk (“Rootwork”) project exploring the concepts of soil, home and Riesling. Four winemakers from three wineries are involved: Johannes plus Stefanie and Alwin Jurtschitsch from the Kamptal in Austria and Max von Kunow of Weingut von Hövel in the Saar. They all exchanged a portion of their harvest in 2012 with the motto, “Give me your juice; I’ll give you mine”. Grapes from their superb vineyards were vinified similarly with minimal intervention (spontaneous fermentation in stainless steel) in three separate cellars, each with a personal interpretation. The result, a disruptive, exchange of thought, and stimulation of what could be next! Most of the wines in this offer are from the 2015 vintage with a few special museum releases from 2012, 2009, 2002 and 1998 thrown in the mix. It would be fair to say that 2015 is a kind of first among equals. Never before have we (or the Prüm family) seen a vintage with both such power and depth (brought on by the very warm July and August), and yet such bracing freshness and purity (ensured by the very cold September). A mild winter, changing weather conditions in spring, a hot summer, followed by a cool and rather rainy September and then excellent harvest conditions in October resulted in an intriguing, very promising vintage! After a very mild winter, bud break took place in the second half of April, slightly earlier than the long-term average. May and June both brought remarkable fluctuations in temperatures – in May from below 5°C (40° Fahrenheit) at the beginning of the month up to 28°C (above 80° F) in mid May back to below 5° C later that month, and then in June between 8°C (45°F) and 33°C (above 90° F). However, while May overall was a dry month, June had 10% more rain than the long-term average, preparing the soils with good humidity for sunshine and hot temperatures during the months of July and early August. Temperatures then constantly dropped and September was even cooler than the long-term average. The cooler temperatures were helpful during the rainy periods in this month, preventing them from severe rot. Very luckily, October was not only slightly cooler but also much drier than average, providing excellent harvest conditions. We slowly started harvest in early October and finished on 4th November. Being very blessed by nature, we were able to harvest all Prädikat levels from Kabinett to TBA, excluding Eiswein. 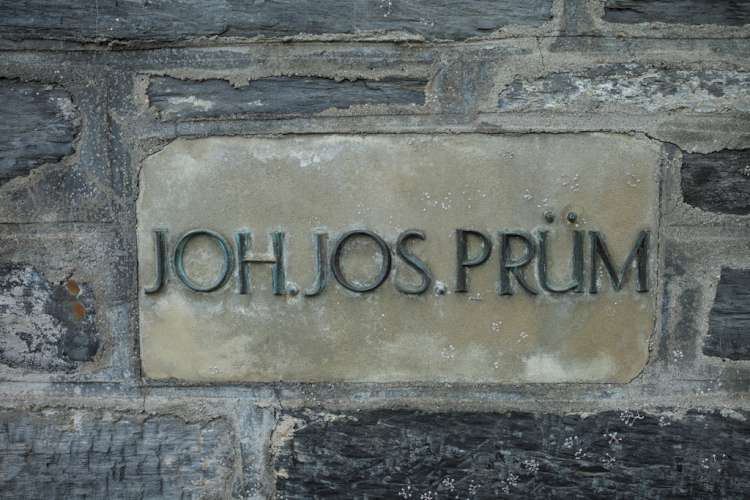 Prüm’s winemaking often results in a burnt match aroma in young wines and wines just opened. As the wines age the character tends to dissipate. If you’re drinking a young Prüm it’s worth making sure you have time to allow it to breath in glass or to decant on openning if necessary. This was the first - among very few - wines in the 2015 Prüm lineup to lead with a bit of yeasty fermentative "Mosel stink," but that veil soon parted more than sufficiently to showcase an alliance of ripe honeydew melon with cassis, grapefruit, and hints of cress and lemon peel that subsequently lend incisive, piquant invigoration on a delicate, polished, infectiously juicy palate. Penetrating and sharply focused, but without its efficacious and enlivening acids turning at all aggressive, the tinglingly, refreshingly citric yet soothing and cooling finish serves up a shimmering array of stony, smoky, alkaline and crystalline nuances. A great spätlese that is really ripe, but still vibrant, elegant and subtle. Sensational interplay of all the components that make this a very classic example of this category. This has a personality all of its own (something floral that's unusual for this site). No need to hurry before 2050! Riper, sweeter German rieslings from Mosel are naturally low in alcohol, and their superb delicacy and fragrance are seductive. This spatlese has subtle apple, citrus and blossom aromas with a lovely honeyed overlay. Light and fine in the mouth, it finishes long, zippy and aromatic. Does not smell remotely sweet. Freshly squeezed lemon. And so much lemon on the palate that it tastes, at this stage, more deep cleansing than dessert. Icy ground rocks and lemon peel and monastic severity for an Auslese. Linear. Ignoring everyone. Stern beauty. Fresh lemon, grapefruit, quince preserves and crème de cassis combine for an attention-getting nose and a polished, rich, but insistently bright and juicy palate. The freshness and invigorating tang of citrus and apple are rare for an Auslese, but quince jelly and candied citrus peels simultaneously project confitured concentration. The seductively luscious finish is more soothing and less dynamic than that of the remarkable corresponding Spätlese, but even longer. Quite closed on the nose, but this is already gorgeous on the palate. The myriad ripe fruits are so precisely delineated, the acidity so vital and urgent that if you drink it now you'd still be stunned in spite of missing some of the riches it has to offer. Everything is perfectly in place, and the finish is literally breathtaking. That special J J Prüm scent is beginning to find its equilibrium. The customary herbaceous note has mellowed into a gently minty and fumy composition to add complexity to the fragrance of ripe local fruit. There is nothing ostentatious about the nose, but the palate is still very tactile, almost astringent with minerality, adding quite a bite to the juicy expression of grapefruit and peach. Pink grapefruit, banana, cassis and lily perfume announce the extreme ripeness of fruit that informed the Prüms' 2009 Graacher Himmelreich Riesling Spätlese. Juicy and extroverted on the palate, it packs a sense of sassy brightness that perfectly compliments any tendency toward extravagant or over-indulgent ripeness. As to your being over-indulgent by drinking some, I'd say, "yes, you would be - fortunately." I see no need to wait for a half dozen years to approach this. On the other hand, if you wait 25, this wine will still be waiting for you and in good shape. Graacher in extremis. Like the GH Kabinett, this is so tight yet equally alluring in both depth and earthy personality. The wine’s structure and presence suggest a wine cast from stone, not grapes. There is so much yet to unfold here, the Graacher’s origin is detectable through its smoky, citric, mineral essence, its filigreed elegance and latent horsepower. Pure class. Apricot pit, lime zest and clove on the nose. The delicate nectarine fruit and creamy texture is held aloft by nutmeg and mineral salts. An element of slate provides spice on the enticing finish of this bright, lively wine. This wine has everything we look for in a Prüm Auslese. Great intensity, serious depth of fruit, yet somehow it remains feather-light and extremely bright and fresh. Remarkable balance. 8% alc/vol. The Prüm 2009 Graacher Himmelreich Riesling Auslese mingles spiced apple, papaya, pink grapefruit, cassis, and white raisin in a lush, creamily-textured, pungently botrytis-tinged performance full-throated from nose through peacock's finishing flourish, and hard to beat for sheer diversity and audacity of fruit... in reality this is a wine that deserves a long time in the cellar and is apt to retain and add to its present virtues over a 30 year period. Vivid and pure-tasting, with a well-structured array of mineral, peach, citrus and savory spice notes that are tightly wound. Still, this is quite airy, especially on the impeccable finish of lime and nectarine. Best from 2015 through 2038. Utterly consistent with the character of the corresponding Kabinett and Spätlese, this projects quince, honeydew, cherry and lime, coolingly and alluringly laced with mint, basil and wintergreen, and wreathed in seductive, lily-like perfume such as one would more likely encounter from Wehlener Sonnenuhr. Certainly this is sweeter than its lower-Prädikat counterparts, but sweetness is not what’s on one’s mind while enjoying it, and there is also liveliness to the fresh, juicy lime component that conveys refreshment rare for an Auslese and pushes back against the wine’s residual sugar. The overall impression is lusciously sorbet-like. The feel is glossy and slightly viscous but buoyant, and in this respect, too, the sense of citricity is highly efficacious, engendering remarkable liveliness for an Auslese that offsets the wine’s richness. The superbly sustained finish cools and soothes even as it animates and refreshes. Conjures up images of a tropical garden after rain where everything is dripping. Very delicate in spite of the high ripeness with an almost breathtaking balance of sweetness and acidity that runs right through into the very long finish. About Prüms Goldkapsel wines: Think of them as limited edition, rather small production lots of the best Auslese of a vintage. 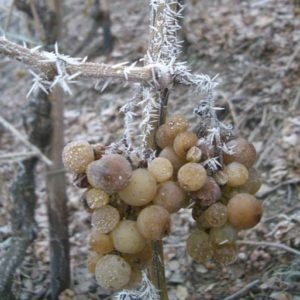 They are made from stronger selected grapes containing higher concentrated juice, usually affected by a certain amount of botrytis / noble rot, capable of aging even remarkably longer than “basic” Auslesen, lasting for many decades. In the course of time, they lose some of their sweetness, gain more and more elegance and harmony and the complex profile and depth come to the forefront. Rich golden yellow. Heady aromas of strawberry and nut oils, with only a gentle hint of honeyed botrytis. White peach fruit essences and mineral salts animate the creamily rich yet delicate palate. More concentrated than the other ausleses and showing a distinctly aristocratic personality. One of the most impressive ausleses of the vintage. Intense honey nose. Very firm indeed with vibrato. A special smoked meat and honey production. Not as small a quantity as they originally expected. Picked late November when botrytis suddenly appeared. So delicate and so sweet! Lychee.